There was a little bit of buzz Monday night about WWE changing a match graphic midway through Raw. I’m amazed people notice this stuff, honestly. 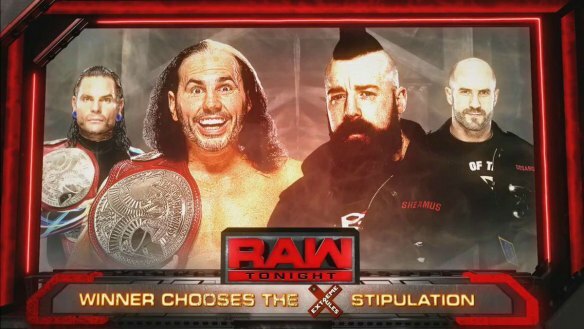 In advertising the Matt Hardy/Sheamus match, WWE initially showed the above image. Later in the show it was changed to show us a more even tempered Matt. Rumor has it this was done to avoid drama over the “Broken” intellectual property, which is owned by Anthem Sports and Impact Wrestling. That’s obviously much to the chagrin of wrestling fans who want to see Broken Matt and Brother Nero in WWE. ProWrestlingSheet.com has the full story, for those interested. I don’t know that I agree with what Anthem has done here. As an artistic type, I’m usually inclined to favor creator ownership, and the Broken stuff always seemed like it was coming straight from Matt and Jeff. But I can appreciate the situation Anthem finds themselves in. The Broken characters generated interest the likes of which they haven’t seen in years, and certainly haven’t seen since. They want that stuff associated with the Impact brand. It’s good business. But what’s not good business? Damaging your rep with wrestling fans even further. 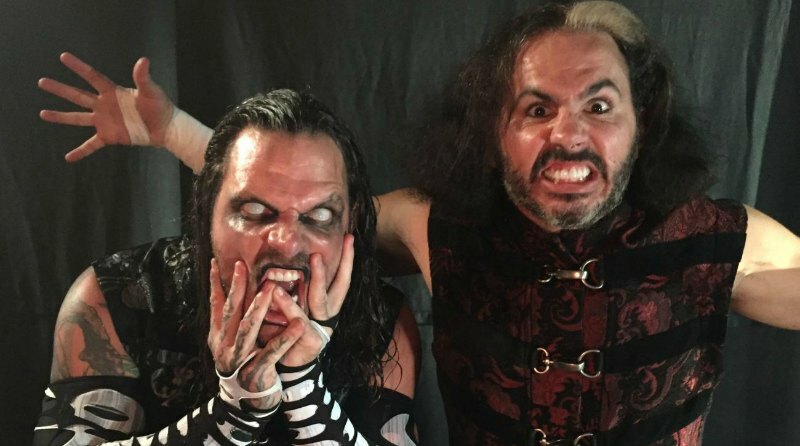 Now as much as ever, people love the Hardys. Fans are going to be on their side, especially when it comes to these Broken characters. In keeping that IP locked up, Anthem is denying us one of the hottest acts in all of wrestling. That has already created a backlash resulting in a lot of bad press. And if there’s one thing Impact doesn’t need more of, it’s bad press. So yes, Anthem’s retention of the Broken Hardys IP is good business…for now. But how much money are they shooing away in the long run by leaving a bad taste in the mouths of potential viewers? I shudder to think. 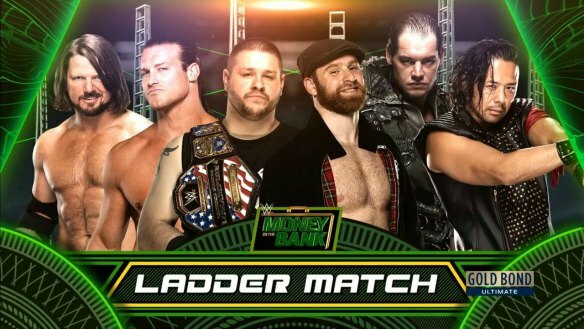 Shane McMahon announces the participants for the 2017 Money in the Bank Ladder Match: AJ Styles, Baron Corbin, Sami Zayn, Dolph Ziggler, Shinsuke Nakamura, and Kevin Owens. Pretty good line up. Nakamura and Styles in the same Ladder Match? That may be worth the price of admission alone. I got curious when Ziggler came out, so I looked it up: This will be his seventh Money in the Bank Ladder Match. One more and he’ll have appeared in more of these than anyone else. Of course, they put him in these things because they know how good he is at them. Can’t be easy on his body, though. Charlotte Flair and Becky Lynch def. Natalya and Carmella. And so the Charlotte babyface turn continues. I was waiting for the other shoe to fall. Later on, they made a Fatal Five-Way for next week to decide the top contender for the Women’s Title. What is their obsession with Fatal Five-Way Matches lately? It’s like a shiny new toy they just can’t put down. Rumor has it Carmella is in line to hold the belt next, so there’s a decent chance she’ll walk away with it. Sami Zayn def. Baron Corbin with a quick roll-up. Corbin destroys Zayn after the match. Damn. Corbin can’t seem to buy a win these days. That’s…okay, the more I think about it. Not everybody should be an unstoppable giant. It’s also pretty obvious that Corbin lacks the experience that guys like Zayn and Orton do. Plus, win or lose, he beat the hell out of Zayn in the end. 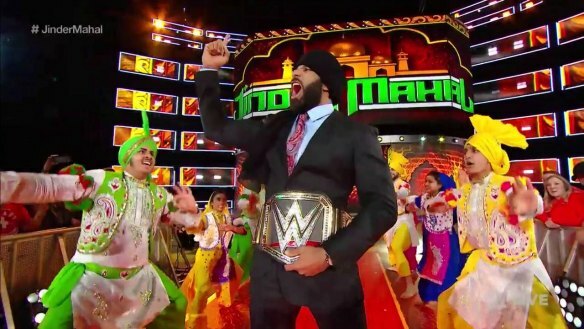 Jinder Mahal holds a Punjabi celebration after winning the WWE Title at Backlash. Randy Orton to invoke his rematch clause at Money in the Bank. Surprised as hell that Orton didn’t come out and trash this thing. That’s usually what the babyface does. I’m assuming they wanted to hammer home this Jinder Mahal thing that much harder. Tyler Breeze def. Jey Uso with a distraction roll-up in a quick match. Fandango then does the same to Jimmy Uso. Factoring in the Corbin/Zayn match, that’s three roll-up finishes in the same broadcast. I get that they were going for comedy, and I like Breezango more and more as the weeks go by. But that’s too much. The Usos def. Breezango to retain the Smackdown Tag Team Titles. At least it didn’t end with a roll-up. I imagine they’re gearing the Usos up to face the New Day soon. But WWE would do well to keep Breezango on television. They’ve become a really fun act. Side note: Where is American Alpha? Are they just giving them a little break? 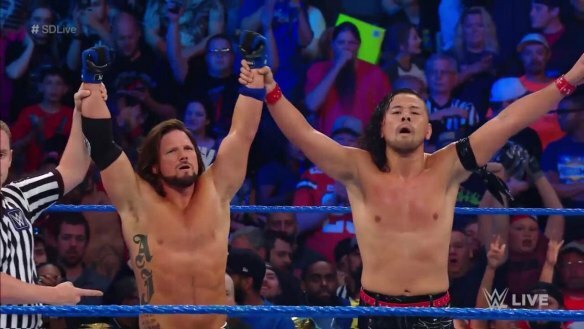 AJ Styles and Shinsuke Nakamura def. Kevin Owens and Dolph Ziggler. Both the announcers and the fans made a big deal out of Styles and Nakamura teaming together for the first time. Rightfully so, given their history in New Japan. I enjoyed seeing Styles work with Ziggler here. Typically when they’re building to a multi-man match like this, they have everybody wrestle each other in singles matches during the build-up. So we could see our first Styles/Ziggler match as early as next week. They kept calling Nakamura a rock star, as if that’s his new nickname. Meh. There’s worse things to be called, I suppose. This entry was posted in Wrestling and tagged AJ Styles, American Alpha, Anthem Sports & Entertainment, Baron Corbin, Becky Lynch, Breezango, Broken Matt Hardy, Carmella (WWE), Charlotte Flair, Dolph Ziggler, Fandango, Impact Wrestling, Jeff Hardy, Jinder Mahal, Jinder Mahal WWE Champion, Kevin Owens, Matt Hardy, Money in the Bank Ladder Match, Natalya (WWE), Randy Orton, Sami Zayn, Shane McMahon, Sheamus, Shinsuke Nakamura, The Hardy Boyz, The Usos, Tyler Breeze, WWE Money in the Bank, WWE Money in the Bank 2017, WWE news, WWE rumors, WWE Smackdown, WWE Smackdown Live, WWE Smackdown Results on 05/24/2017 by primaryignition.